NEW YORK, NY--(Marketwired - Oct 17, 2013) - Konstantine Trichas, DDS of Upper East Side Dental Arts has announced the recent launch of his practice's new website. Custom-built in collaboration with Rosemont Media, the site is now equipped with a responsive website design element that enables it to automatically calibrate to fit the screen size of any device -- computer, tablet, or smartphone -- from which it is being accessed. Aside from its visual and content-oriented aspects, the website also is equipped with SEO and SMO strategies implemented to help the New York City dentist maintain competitive positioning for highly-targeted terms on popular search engines. Ultimately, the partnership of Dr. Trichas and Rosemont Media produced a unique website that effectively reflects the patient-first vision of Upper East Side Dental Arts. Dr. Trichas graduated from SUNY Buffalo School of Dental Medicine and went on to complete a general practice residency at Muhlenberg Hospital in Bethlehem, PA. At Upper East Side Dental Arts, he offers a variety of dental treatments and procedures including porcelain veneers, Invisalign®, dental implants, and more. Additionally, he received a fellowship at the Academy of General Dentistry, and is a member of the American Academy of Cosmetic Dentistry. Dr. Trichas is available for interview upon request. 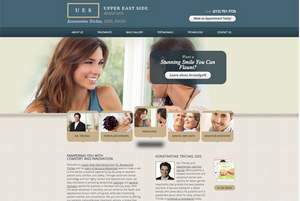 To view the original source of this press release, click here: http://www.rosemontmedia.com/dentists-blog/new-york-city-dentist-boosts-online-presence-with-responsive-website-design/.